Section 1. Laws of North Carolina (Public) 1871-1872, Chapter LXXVII. THE GENERAL ASSEMBLY OF NORTH CAROLINA DO ENACT, That all the part of Cherokee County included within the following bounds, to wit: Beginning at a stake at the mouth of Slick Rock Creek on the lines of North Carolina and Tennessee, and running with said line to the top of Unacoee Mountains, thence to the Laurel-top, thence with divide mountains between Beaver Dam, Hanging Dog and Snowbird Creeks, to the top of the mountain between Snowbird Creek and Valley River and Cheoee; thence east, with the meanders of the mountain to the top of the same, to the line of Cherokee and Macon Counties; thence northward with that line to the bank of Tennessee River, thence with the members of the bank of said river to the beginning; be and is hereby created into a separate and distinct county, by the name of Graham, with all the rights, privileges and immunities incident and belonging to the other counties in this state: Provided, said county shall not be entitled to a representative under the apportionment made by this general assembly. Section 2. This act shall be in force from and after its ratification. "Ratified the 30th day of January, A.D., 1872." 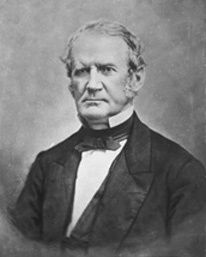 The county was named for William A. Graham (1804-75), member and twice Speaker of the NC House of Commons (1833-40), U. S. Senator from North Carolina (1840-43), Governor of North Carolina (1845-49), Secretary of the United States Navy (1850-52), nominee of the Whig Party for the Vice Presidency (1852, as Winfield Scott's running mate), member of NC State Senate (1854-66, serving in the Confederate Senate from 1864-65). Graham was born on Vesuvius Plantation, the residence of his father, General Joseph Graham, in Lincoln County, North Carolina, 5 September, 1804. He sprung from that sturdy Scotch-Irish race which has furnished so many prominent men to the Republic. His mother was Isabella, daughter of Major John Davidson, who was one of the signers of the famous "Mecklenburg Declaration of Independence " at Charlotte on 20 May, 1775, of which John Adams wrote: "The genuine sense of America at that moment was never so well expressed before nor since." The citizens of what had previously been called Cheoah Valley set about the task of organizing the new county. On October 21, 1872 the first County Commissioners-elect met at King and Cooper's store located on the present site of the Robbinsville Elementary schools. The commissioners were J. J. Colvard, John Sawyer, N. F. Cooper, G. W. Hooper, and John Gholey. J. W. King administered the oath of office as a justice of peace, and J. J. Colvard was elected as chairman. Official bonds were approved and the oath of office given by J. W. King for the following other Graham County officials: Sheriff - J. S. Hyde; Register of Deeds - William Carpenter; Clerk of Court - John C. Tatham; Treasurer - John Barker; Surveyor - Rueben Carver. It was then stated that the first term of the Superior Court of Graham County would be held at the Baptist Church of Cheoah Valley now known as the Old Mother Church located about one mile from Robbinsville. The first court duly convened in the church building in March, 1873 with Judge Riley Cannon presiding. On December 7, 1872, the county commissioners held a public hearing to select a suitable site for the new county seat. Three sites are reported to have been under consideration: Rhea Hill, Fort Hill, and the property of the C. A. Colvards. Tradition is to the effect that the majority of its residents wanted the county seat located on Fort Hill. However, the surveying party stopped on the way to work to refresh themselves at a still house located near the present courthouse. The surveying party became overly refreshed and emerged from the building to start surveying immediately at that spot, thus locating the courthouse adjacent to the still house. Rhea Hill was named for Thomas Rhea, a prominent citizen at that time and postmaster at Fort Montgomery in 1871. Although the official records do not support the traditional version related, it does blend well with some of the early official transactions. On December 6, 1872, only six weeks after the county government began operation, the Graham County Board of Commissioners issued the following order: "Ordered that B. L. Sawyer have license to retail spirituous liquors for the term of six months on condition that he, said Sawyer, comply with the law in regard to said retailing and further said Sawyer keep his doors shut up as to the selling of liquor on all public preaching days in the vicinity of Cheoah Township." On June 2, 1873, the county Commissioners issued another retail spirituous liquor license to Thomas Hensley permitted Hensley to retail liquor in the Town of Robbinsville. However, the first commissioners did not neglect the fundamentals necessary for a functioning county government. Since a county seat had been selected, a new courthouse had to be built. G. W. Ditmore on February 3, 1873, had been paid two dollars for two days work in laying off the new town. In May of the same year bids for Graham County's first courthouse were accepted. John W. Harwood, with a low bid of $1,075, was to complete the building one year later. The first courthouse was a simple wooden structure on the northwest corner of the present site with a stairway to the courtroom from the outside. The first session of court was held there in the fall of 1874. The original courthouse served the county for some two decades until the floor collapsed during a sensational murder trial due to the large throng of people who crowded in to witness the trial. The court session was adjourned and reconvened in the Cooper-King store building. A larger wooden courthouse was erected and dedicated in July 1895. This building remained in use until it was razed to make room for the present native stone building, which was first used in 1942. The old wooden courthouse was the last wooden one to be used in North Carolina. The second courthouse built in Graham County, 1894-95, the last wooden courthouse in NC. The first Post Office building in Robbinsville (it was previously housed in various stores). Willard Slaughter (front), Malcolm Slaughter, and Katherine Eller Dance. The early records also bear evidence of the devotion of our forefathers to law and order, as in November 1873, when the Board of Commissioners accepted a bid from its own chairman, J. J. Colvard, in the amount of $299, to construct Graham County's first jailhouse near where the new courthouse was being built. There is considerable difference of opinion as to how the county seat, Robbinsville, received its name. One account is that Robbinsville was named for James L. Robinson, a senator in the state legislature from Macon County at the time of the formation of Graham County. Another version is that a Mr. Robbins from Clay County moved to Cheoah Valley and taught in the first school. Some believe the newly organized town honored the first schoolmaster. However, it is rather generally accepted that the county seat was named for James L. Robinson even though the spelling of the town name favors the other version. Members of the General Assembly representing Graham County, NC (Graham County voted with Cherokee from 1872 until 1883). Surface of Graham County - hilly, mountainous in many places, with rich valleys, soil, and water power. Staples: Corn, wheat, oats, rye, buck wheat, medical herbs, grass, and live stock. Fruits: peaches, apples, pears, berries. Timber: black walnut, white pines, black locust, chestnut, wild cherry, poplar, oaks, variety of shrubs.